Contact Jenkins & Wynne today for information on dozens of vehicles like this 2001 Honda Accord Sdn EX w/Leather. The incredibly low mileage and painstaking upkeep on this Honda Accord Sdn makes it a once-in-a-lifetime deal that won't last long! Call us today to reserve your test drive! Surprising quality accompanied by a high level of performance...this Firepepper Red Pearl on Ivory Honda Accord Sdn EX w/Leather could end up being the perfect match for you. This is the one. Just what you've been looking for. This Firepepper Red Pearl Honda is clean and shiny exterior makes it look like it came straight from the factory. Although every reasonable effort has been made to ensure the accuracy of the information contained on this window sticker, absolute accuracy cannot be guaranteed. Vehicle information is based off standard equipment and may vary from vehicle to vehicle. The prices are subject to change. Price does not include applicable tax, title, license, and doc fee. 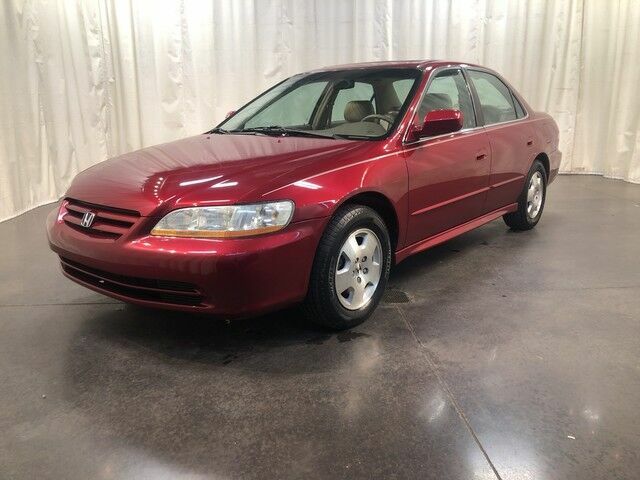 This 2001 Honda Accord EX is a 4 door 3.0L V6 front wheel drive sedan! This beauty has tan leather interior in GREAT condition, CD player, power locks and windows, moon roof, this is the all around PERFECT little car!